In an unprecedented move, political group leaders in the European Parliament have decided to suspend negotiations with EU member states on five major justice and home affairs dossiers in protest against their decision to unilaterally rewrite rules related to the EU's boder-free Schengen area. 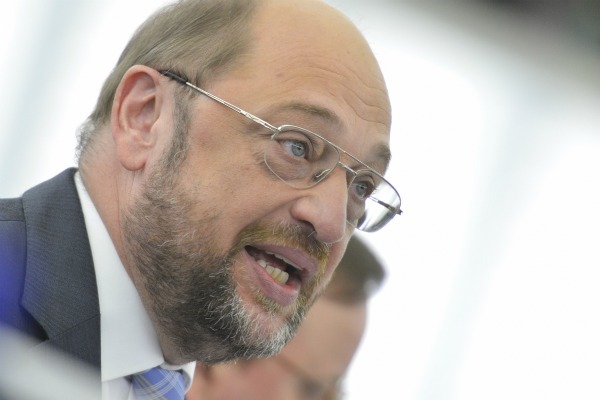 Martin Schulz, European Parliament president, dramatically announced the extraordinary move during the Assembly's plenary session in Strasburg yesterday (14 June). "It is without precedent that in the middle of the legislative process, one co-legislative chamber excludes the other," Schulz said. At issue is a decision by the EU's 27 justice and home affairs ministers, who unanimously agreed on 7 June on new rules allowing member states to re-introduce internal border controls in the Schengen passport-free area, without referring the matter to Parliament. "The JHA Council's approach of 7 June represents a slap in the face of parliamentary democracy and is unacceptable to the directly elected representatives of European citizens," Schulz said. "This is why the [Parliament] is forced to take these severe measures." By majority decision, the Parliament's political group leaders decided to block progress on five major dossiers related to Justice and Home Affairs, including amendments to the Schengen border code, judicial cooperation on criminal matters and the 2013 budget related to internal security. The decision was taken while negotiations with other EU institutions were still in progress on the Schengen governance reform package, comprising two key legislative files, one related to the reintroduction of border controls (Weber report) and one on the evaluation of Schengen (Coehlo report). Speakers from all major political groups slammed the Danish EU presidency for what they said was a “direct attack on the EU's fundamental values”. “For my part that, since the evening of 7 June, the Danish presidency is no longer a credible interlocutor," said Joseph Daul, leader of the centre-right European People's Party (EPP) group, the largest in Parliament. "From now to June 30 at midnight, we shall address ourselves exclusively either to the European Council or informally to the next presidency, of the Republic of Cyprus,” Daul said. Cecilia Malmström, EU Commissioner for Home Affairs, tried to calm down the dispute, and appeared to side with the Parliament by calling on the Council to reconsider its stance. ''I find it wise of the European Parliament not to put the Weber and Coelho reports on the July plenary session agenda. I call on the Justice and Home Affairs Council to also devote some time for reflection on these two files and not to formalise any Council decision. The European Commission stands ready to meet with the other two institutions to seek common ground to design a well-functioning Schengen area''. The Danish EU Presidency said it regretted the Parliament's decision. "The presidency thinks it is sad that the European Parliament has decided Thursday to suspend the cooperation with the Council about some, but very important issues,” said the Justice Minister of Morten Bødskov, according to Danish news agency Ritzau. “The Danish EU Presidency is ready for and wishes on behalf of the Council...a constructive cooperation with the European Parliament in all areas,” the minister added. Bødskov added that a good cooperation was in everybody’s interest “not least in this time of crisis”. The Minister for Justice also assured that he and all the other Danish ministers that currently represent the EU’s member states in negotiations with the Parliament want to cooperate with the MEPs in every area. Guy Verhofstadt MEP, leader of the liberal and democrats group in Parliament (ALDE) defended the decision taken by the EU Assembly as a "proportionate" response to "the Council's presumptuous disregard for Parliament's rights." "Parliament must stand up for the Community method and its legislative prerogatives and not allow itself to be bullied and pushed around by the Member States who clearly consider democratic scrutiny to be an unnecessary inconvenience." The European Conservatives and Reformists (ECR) group in Parliament, slammed the Parliament's reaction as "hysterical" and accused MEPs of putting their own interests before the citizens'. "Many hysterical MEPs said that the action by national governments was tantamount to a 'declaration of war' on the parliament," said Timothy Kirkhope, a British MEP who is justice and home affairs spokesman for the ECR. "The European Parliament has decided to put its own self-aggrandisement ahead of the safety and security of European citizens." Today, the Schengen border-free area consists of 25 member states: 22 EU countries (all except Bulgaria, Romania, Ireland, Britain and Cyprus) as well as three associated countries: Norway, Iceland and Switzerland. Denmark has signed the Schengen agreement, but has kept its freedom not to apply certain measures. Following the ‘Arab spring’ of 2011, diplomatic tensions mounted between Paris and Rome over an arrival of refugees from Tunisia. France and Italy called for a Schengen re-write, and the Commission issued a legislative proposal for better management of borders. The situation was further complicated with the massive arrival of illegal immigrants across the Greece-Turkey border. In a joint letter to the Danish EU presidency in April, French and German Interior ministers asked to repatriate powers from the EU Commission, which would allow them to re-establish border controls as a matter of national sovereignty. I am very happy to see parliament take this strong stance on what is an affront and an insult to what the EU stands for and to it’s citizens. Xenophobia, racism and discrimination have no place in Europe or anywhere else. The EU’s justice and home affairs ministers who are responsible for this attack on our core values and principles are an embarrassment to Europe. The best way for the EP to make sure that it is properly involved in legislation on justice and home affairs is to table a proposal of revision of the relevant Treaty articles . The rest is just agitation. It is regrettable that EP is concentrating its energy on such trifle disputes when the economic and political crisis threatens the very existence of the EU. It is regrettable that the EP has no position nor opinion in the current debate on more political integration; it is a paradox that such progress is advocated by a member state (Germany) and not even supported by the EP !